An email to this Website from John Saxby-Hill alerted us to the existence of dozens of his grandfather's photographs. John wanted us to show these photographs on the archive which we are pleased to be able to do. Many were in poor condition, some were chipped and all were in their negative image state on glass plates. After quite a bit of work to digitize and restore the images they are available to view here (all images are stored on Flickr - click on any parish album and then on one of its images. This will then open a slide show display). Samuel Saxby-Hill had settled in Paglesham in the early years of the 20th century after his marriage. He was a contemporary of William Atkinson the violin maker who, like Samuel, had arrived in the Essex village from London. After some years Mrs Saxby-Hill found life in the countryside rather restricting so in 1924 the couple moved to a new house they had built not far from the present site of Southend Airport which at that time was in Rochford parish. 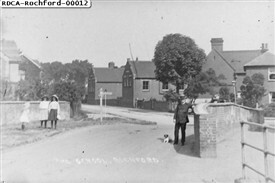 Their house is still there and could be recognised from the photograph which Samuel took. 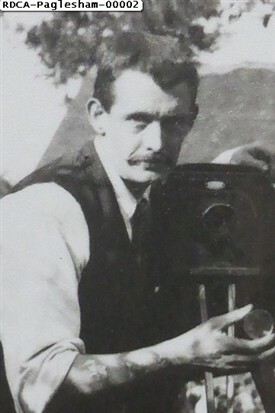 Samuel made his living and kept his growing family through his talent for photography. He rode his bicycle all over the district taking pictures of the people and scenery which caught his eye. Carrying the heavy, bulky camera, the supply of glass plates and tripod must have been no mean feat. They are an interesting record of some of the buildings, people and vehicles in the district at the end of the 19th century and the early years of the 20th century. The negative images on plates about 10 cm X 15 cm were developed and printed into postcards, most places were identified in Samuel's hand written titles. The finished postcards were then sold to the many people who made day trips and holiday visits to the Essex villages. The move to Rochford, enabled Samuel to start a business in a shop when the new parade near the Ann Boleyn public house on the Southend Road was built in the 1930s. He framed and sold his photographs as well doing general framing. A talented artist, there was also a demand for his paintings. 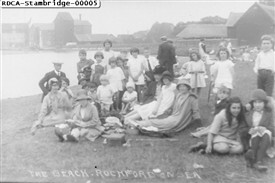 Samuel and his wife lived in Rochford for many years and his grandson, John, remembers with affection the holidays he spent there. His grandmother worked on her allotment growing vegetables and grandfather cycled off each day to open his shop or to take more photographs. This page was added by Robert Stephen on 13/06/2016. Thank you so much for all the effort you have made to display my grand fathers photographs and the outline of his life and work in Rochford. Other members of my family have seen the article and were thrilled with the feature and his recognition, as was I. If any further plates are discovered from the family I will endeavour to pass them on to you. Sorry I have been so slow to respond to the article but we have had a change of landline number and email address which led to some confusion! The above email was sent to us on 11/09/17 by John Saxby-Hill. Bob Stephen (RDCA-Admin).